When researchers analyzed vials of treated wastewater taken from a plant where about 90 Indian drug factories dump their residues, they were shocked. Enough of a single, powerful antibiotic was being spewed into one stream each day to treat every person in a city of 90,000. Pharmaceutical contamination is an emerging concern worldwide. In its series of articles, AP documented the commonplace presence of minute concentrations of pharmaceuticals in U.S. drinking water supplies. The AP also found that trace concentrations of pharmaceuticals were almost ubiquitous in rivers, lakes and streams. Last year, The Associated Press reported that trace concentrations of pharmaceuticals had been found in drinking water provided to at least 46 million Americans. But the wastewater downstream from the Indian plants contained 150 times the highest levels detected in the U.S. This capital’s growing thirst for clean water is clashing with provincial demands and concerns that plans to tap China‘s rivers will hurt an already troubled environment. As a result, China has delayed by four years a project to transfer water more than 600 miles from a tributary of the Yangtze River to Beijing and Tianjin, pushing the completion date to 2014. First proposed by Mao Zedong in the 1950s, the south-to-north water diversion is designed to maintain explosive industrialization in – and migration to – the country´s northern cities. Critics of the $62 billion project have long argued that it is riddled with environmental flaws. Some of the strongest calls for a delay come from officials in central Hubei province, home to the Danjiangkou Dam, where the water would originate. To ensure Beijing´s thirst is not quenched with dirty water, “Hubei must build even more water-treatment plants and ecological restoration facilities,” Mr. Wang said. The project originally was slated to be finished by last summer’s Olympics. The central route, one of three planned large water projects, is designed to divert 44.8 billion cubic meters of water each year from the Han River, a major tributary of the Yangtze, to supply Beijing and Tianjin. China surely has much to learn from the United States when it comes to reducing air pollution, and who better than Environmental Protection Agency chief Stephen L. Johnson to return to the Middle Kingdom for a week-long trip — his second visit there in a year — to help them out. Johnson is part of a group of Cabinet officials traveling to Beijing for an economic exchange trip at the end of the week. But, hey, that’s a long way to go just for a two-day meeting. So he’s already arrived in Shanghai, got there Sunday, for an important roundtable discussion with American and Chinese businessmen “on the importance of sound environmental regulation and consistent enforcement.” Then he’s off to talk to students at Tongji University, a highly regarded institution known for its science and engineering faculties. Maybe not the caliber of nearby Fudan University, but quite good. From there he’s off to Xian, in central China, for critical meetings with officials from the Northwest Regional Supervision Center and the provincial Environmental Protection Bureau. There, according to an EPA news release, “Johnson will learn more about the evolving relationship between the RSCs and the provincial EPBs.” As everyone knows, it is essential for the lame duck Johnson, who has seven weeks left as EPA chief, to learn about that important relationship before he heads off to the private sector. 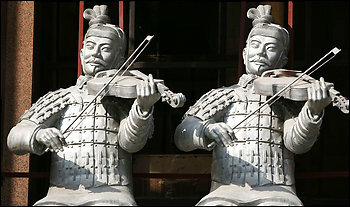 We’ve advised him that if, by some chance, he can break away, there are of course the famed terra-cotta soldiers of the Qin Dynasty (221 B.C.) and an equally impressive dig recently opened just by the airport in Xian. The famed dumplings at that restaurant just outside the city wall are also not to be missed. After that, Johnson speeds off to join other Cabinet officials in Beijing on Thursday for a two-day meeting with Chinese counterparts before rushing home over the weekend to impart all those important lessons to other EPA officials. Coal, Industry and cars make a devil’s brew of air pollution in China. This is Beijing traffic.